MicroSd card not included. The maximum capacity for this model is 64GB. It is important to purchase a good quality MicroSD card. Vantrue recommends the Samsung Evo and we also recommend the Sandisk Ultra A1. Other Sandisk SD cards do not work well with dash cameras. It is also important to buy from a reputable source because there are lots of counterfeit SD cards for sale online. If you would like help picking one out just ask. We have a limited stock of the Sandisk Ultra A1. 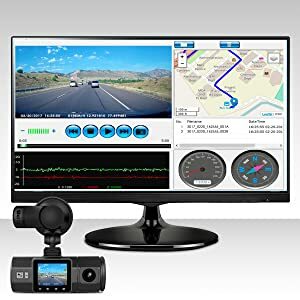 If you would like to purchase one click on the Vantrue Dashcams link. 1. Heat Resistant-We have improved the housing material to make it resist heat damage to the dash cam. Operating Temperature: 32 to 158 deg. F.
2. Stronger Performance-Optimized circuit board, greatly improved the overall performance. 3. More Stable-With the updated mount, you will never have the hassle of dash cam falling off, always enjoy a full protection of your car. Mini dual lens dash cam: Small Size, front facing and back facing camera in one body. DUAL CAM MODE simultaneously captures the road ahead (1440x1080 @ 30fps) and the cabin (1280x720 @ 30fps) in HD video. FRONT CAM RECORDING MODE, 1920x1080 @30fps Full-HD resolution of front cam provides great sharp video quality and super night vision with infrared light for the front cam. 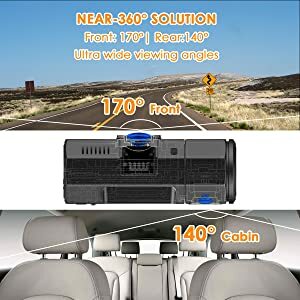 NEAR-360° SOLUTION: Stunning ultra wide angles record road (170°) and interior (140°) with virtually zero fish eye distortion. The rear cam is easily adjustable (80°vertically) for the perfect view. We've got you covered. 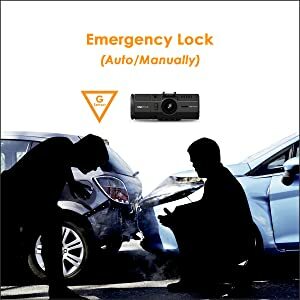 Critical Event: Variable sensitivity G-sensor with Automatic Collision Detection emergency locks video files following impact. Automatic/Manual lock option. Seamless Loop: loop recording overwrites the oldest footage with the newest upon filling a card to capacity. Auto LCD off after the recording begins so you won't be disturbed by another glowing rectangle on your windshield. Support up to 64GB card, please format it to FAT32 first. Dual Parking Modes: Auto switch the dash camera to Parking Mode. Triggered by the Motion Detection, the camera will auto record when people or things come closer to your car in front. Triggered by Time Lapse, the camera will keep taking photos at the set time interval and then auto edit them together to a video clip. 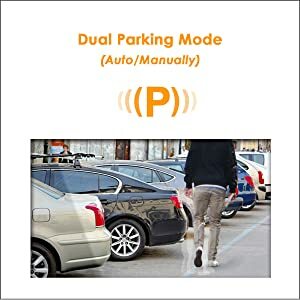 Please note: In parking mode, front and back dash cam starts auto-recording only when it detects movement at the front. No memory card included, Samsung Evo 32GB card is recommended. If you are using a 64GB card, please format it to FAT32 before use. To use the rear camera at night, please turn on the light of your car. Hardwire kit or battery pack is required for parking mode. Powerful Novatek NT96655 CPU drives Front Facing and Rear Facing (In-Car) Dash Cams for superb clarity. DUAL CAM MODE simultaneously records road (1440x1080 @ 30fps) and cabin (1280x720 @ 30fps) in crisp detail, while SINGLE FRONT CAM RECORDING Mode records at 1920x1080 @ 30fps, plus the HDR presents more details from shadows to highlights, recording your journey in excellent quality. 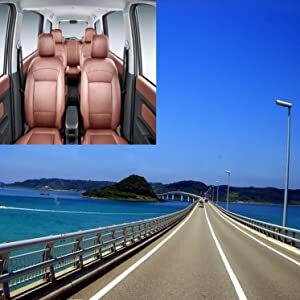 Stunning ultra wide angles record road (170°) and interior (140°) with virtually zero fish eye distortion. While the back camera is 80° up & down rotatable, easy to adjust to the best view point. We've got you covered. Triggered by the Motion Detection, the camera will auto record when people or things come closer to your car in front. Triggered by Time Lapse, it will keep taking photos at the set time interval and auto edit them together to a video clip. In parking mode, front and back dash cam starts auto-recording only when it detects movement at the front. Seamless loop recording plus G-Sensor data protection automatically detect any impact and lock the important video segments to event folder so they are not overwritten or corrupted, preserving a complete record of the event, you will never miss an important moment. Optional GPS module records location, direction, speed, date and time into video clips, allowing you to track the gps information on Map via Vantrue GPS Player. Please note: To use GPS function, please buy a GPS mount.